The section reproduced here is from my page about The Mido Watch Company. The waterproof Decagonal cases with cork stem seal supplied to Mido, and to Patek Philippe, Vacheron Constantin, Movado, The West End Watch Co. and many other companies, were manufactured by Taubert & Fils, who had taken over the famous Geneva watch case making company of François Borgel in 1924. You can read more about the development of the Decagonal case on my page about Taubert & Fils. The name "Mido" comes from the Spanish "to measure". It is pronounced "Me-doe" not "My-doe". There is a page about the history of the Mido watch company at The Mido Watch Co.. The Mido Multifort watch was waterproof, antimagnetic and impact resistant, one of the very first watches with these features. In 1935 the Mido Multifort Automatic was introduced, bringing together for the first time the four features of self winding, watertight, antimagnetic and impact resistant. The Multifort became the best selling Mido watch until the 1950s. To prove that the Multifort functioned under extreme conditions, Mido had it tested by the New York Electrical Testing Laboratories Inc. Tests were conducted in freshwater and saltwater for over a thousand hours. The watches were then subjected to ten cycles of 15 minutes at 50°C followed by 15 minutes at -40°C. The winding crown was subjected to a test representing 34 years of use. Simulated tests of immersion to 13atm (120 m) and ascending to altitudes of 6,600, 13,300 and 16,600 metres were performed. One of the 6 watches tested ceased operating at 13,300 metres, but apart from that the watches seem to have passed the tests with flying colours. Part of the success in the tests was due to the use of specially treated natural cork to seal the winding stem. 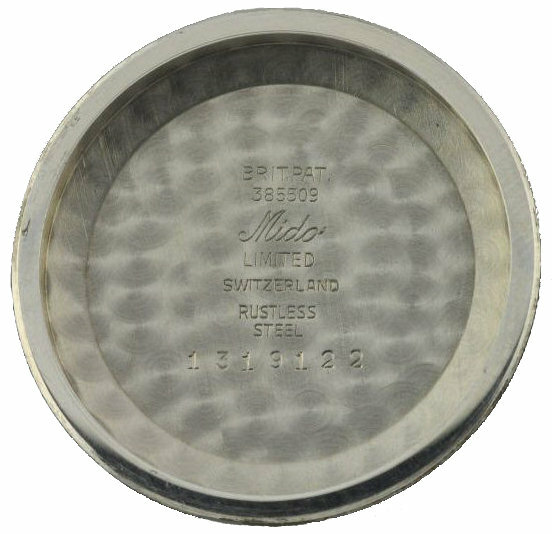 In the history on their web site Mido don't exactly claim to have invented this sealing method themselves, but they do say "Because it formed such a perfect join with the winding shaft, Mido was able to guarantee absolute watertightness even when the crown is pulled out" and "In 1959, this cork system was named 'Aquadura'". Mido case back marked "Brit Pat 385509"
Saying that Mido was able to guarantee absolute watertightness is not the same as saying that they designed or invented the system. Mido were the company with their name on the dial and so had to take responsibility for their products. However, the way it is said implies that Mido invented the cork stem seal, and the current Mido management seem to believe this because they have refused to discuss it with me, although they have told me that they don't have any records from the time. The cases Mido used for the Multifort were without any question the Taubert patented Decagonal cases, with the patented cork seals around the winding stem, that Bernard Taubert also supplied to the West End Watch Co., in 1934, which Taubert guaranteed as 100% waterproof. It seems that Mido had the tests in New York carried out to substantiate Taubert's claims as to watertightness of the Decagonal before they started using them in 1935, before staking their money and the Mido name on their watertightness, so presumably Bernard Taubert called on Mido at about the same time as on West End, but West End were less cautious and had their watch on the market sooner. The case backs of these Mido Multifort watches do not bear the FB-key Borgel trademark used by the Tauberts at the time. They were stamped "BRIT PAT 385509". 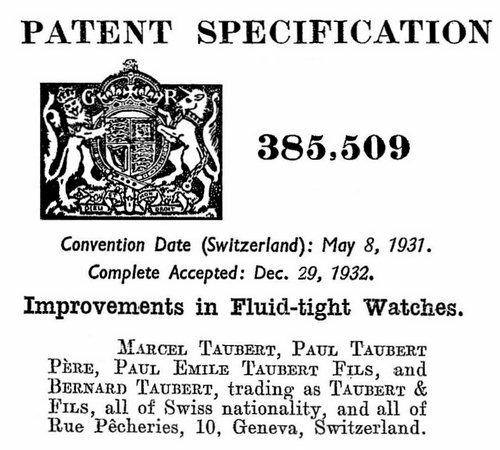 British patent 385509, an extract from which is shown here, was the British version of the Swiss patent for Taubert's waterproof Decagonal case and is proof of their origin. Presumably, like many other manufacturers, Mido didn't want to reveal that the cases were not their own manufacture. Perhaps because they were an early, possibly the first, adopter of the Decagonal case, or as a quid-pro-quo for organising the New York tests, they were able to wring this concession from Taubert, who usually insisted on stamping all cases with the FB-key mark, such as those supplied to Movado and West End. 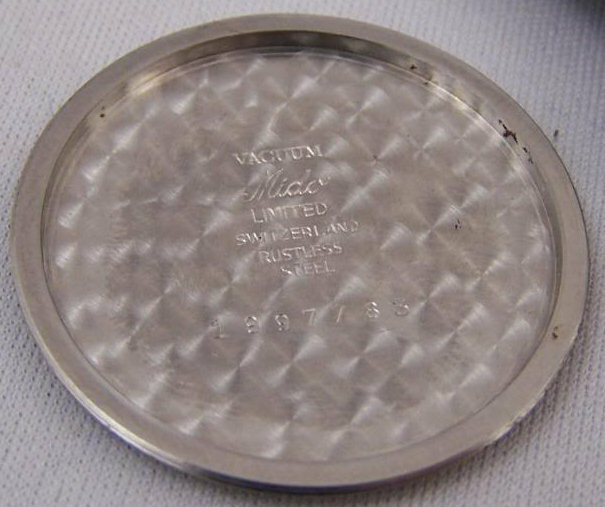 In later Mido watches, the word "Vacuum" is stamped in the watch case back, a trademark the Tauberts adopted in the mid-1950s. See the section Taubert, Manufacture Vacuum for more details. Later Mido case backs didn't even have this explicit reference to Taubert, simply referring to "Modele Depose" (Registered Design) and "Brevet Depose" (Registered Patent) - which must be a reference to the Taubert patent, because they still had the distinctive 10 flats of the Taubert Decagonal case.